SUPERGIRL™ features detailed, brightly colored, 360-degree artwork. Kara Zor-El is SUPERGIRL™, and now from Entertainment Earth, she's transformed into the Supergirl Wittles™ Wooden Doll. Inspired by traditional handmade Japanese wooden kokeshi dolls, this super-cute and collectible SUPERGIRL™ Wittles™ presents the fierce and determined heroine in her iconic blue-and-red outfit, complete with an “S” on her chest and a red cape. Measuring about 4-inches tall, the non-articulated figure features detailed, brightly colored, 360-degree artwork. 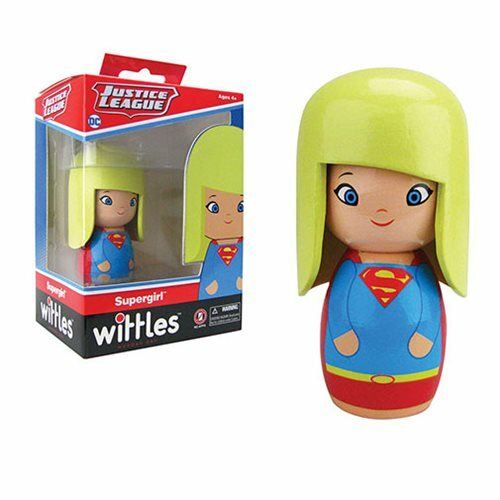 With the Supergirl Wittles™ Wooden Doll, your collection will soar to new heights! Ages 4 and up.